Ten days in New York City with his wife, Debi, had taken a toll on the Rev. Frank Sierra, rector at St. Philip’s in Joplin. They arrived at their house at about 4 p.m., Sunday, May 22, promptly unpacking their luggage before settling to watch T.V. He was exhausted, banking on an early bedtime. A tornado siren. Sierra, like a lot of Midwesterners, was accustomed to its drone: on the first Wednesday during peak tornado months and as a signifier of a funnel cloud, which may or may not produce a tornado. He ignored it. The siren stopped. And started again. “I told my wife this isn’t going to go passed us,” says Sierra, who collected his cat and crank weather radio and, alongside Debi, entered a downstairs closet. They heard high winds and nothing more. hen the audio returned, the weatherman corrected himself. The pulses of light were fractured power lines and behind the veil of rain lurked a twister of monstrous proportion. “We do have a tornado on the ground. I’m telling you to take cover now. Please do not go outside to see this storm, folks. You can’t see anything. It is rain wrapped. This is a dangerous, dangerous situation.” Signals flickered blue and died. 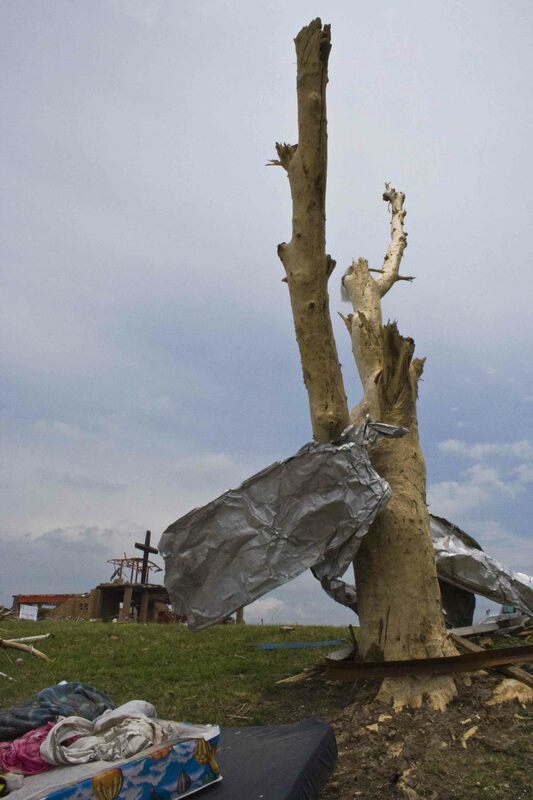 Gray, a member of the Peace Lutheran Church reduced to splinters by the tornado, heard a noise through the patter of rain and pelt of hail. Something was coming: a thousand freight trains. She ripped the blanket from her bed and sprinted for the downstairs bathroom, where she crouched in the bathtub, the blanket swathing her head. Gray says in that instant she missed her husband, the casualty of a heart attack nine years ago. She says the traumatic event, so sudden and total, had embittered her. It was partly why she moved away from Springfield, where they were members of Christ Episcopal Church. 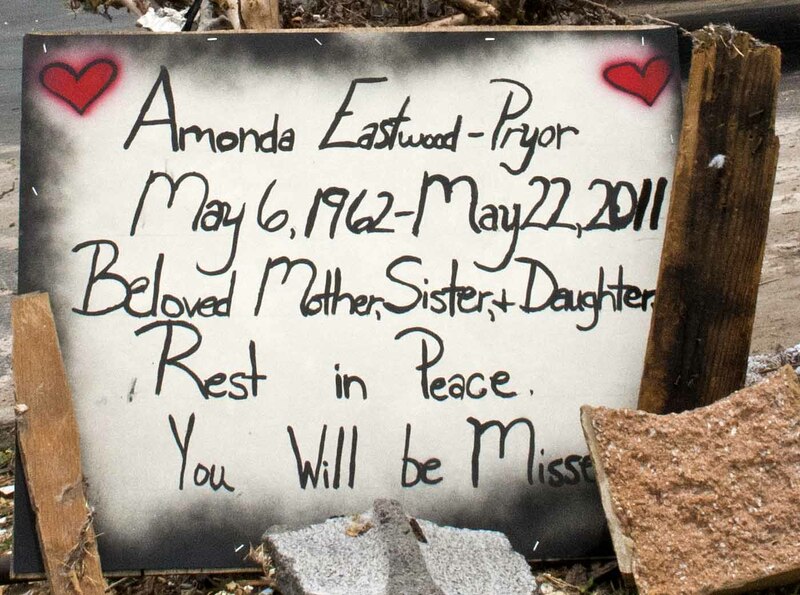 As the tornado drew closer, the freight train sound changed to one of her house succumbing to 200-mile-per-hour winds. Moans, shrieks. Gray says it was like a “demon’s voice.” She prayed aloud, begging for mercy, pleading forgiveness. Overhead the house was lifting and shifting and drumming like a lunatic, Gray’s ears popping so violently she pressed her palms against them to counteract the pressure. Still, she prayed, until she was sure it had passed. The tornado spared her but not her home on Indiana Avenue. She prayed aloud, begging for mercy, pleading forgiveness. few blocks northeast of Gray’s home is St. Louis Avenue, once a part of the Estes family farm. The Rev. Ted Estes’ grandparents bought the land in the late 1920s, gradually parceling it off until all that was left was a small section. Estes’ grandfather preserved the tract for family, dividing it into lots. 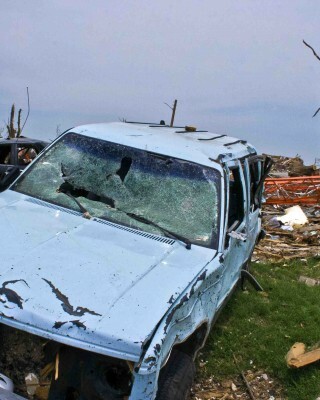 When a tornado warning was issued for Jasper County, seven of Estes’ family lived along St. Louis Avenue, including his mother, three aunts, an uncle, a sister and a niece. 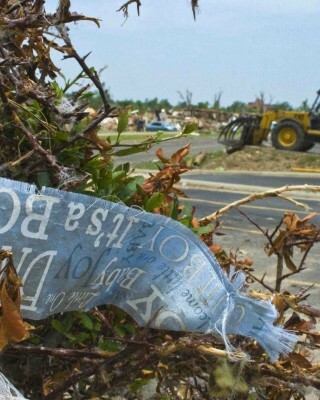 Estes attempted to reach his mother by phone when he learned a tornado hit Joplin. It was to no avail. He got in his car and drove from his Carthage home to find her. The cause for worry increased the closer he got. Traffic into Joplin was at a standstill. Finally, a half mile away, he parked his car, grabbed a hammer and ran. The air was thick with natural gas – so dense, in fact, that smoking was hazardous for days to follow – and fiberglass: he itched from it until he showered later that night. Nothing moved. He noticed that monolithic trees resembled mangled fingers, street signs were hijacked, roads were like rivers of debris. Occasionally, he saw silhouettes of the walking wounded. Estes missed the turn to St. Louis Avenue, not recognizing the house where he had grown up. It was like a ruin from a culture he could study but never know. He called after his mother, but got no answer. A look around the premises produced nothing. He saw a figure in a long black cape and hood. Due to the high water table and rocky soil, most homes in Joplin cannot have basements. Estes marks it a miracle so many people survived in halls, bathrooms and broom closets. Down the block, Estes’ aunt and uncle’s house had a basement. They were dining in it when a hailstorm passed overhead. Or so they thought. Both are hard of hearing and opposed to hearing aids. When Estes’ uncle pried open the basement door, he found the front of his house missing. Estes says they are now more agreeable to hearing aids. There was little relief in the days following the tornado: heat indexes hovered in the triple digits as a foot of rain fell. Thirty volunteers from Grace Church in Carthage spent a 10-hour day cleaning up Estes’ mother’s house, salvaging what they could, chainsawing the trees jutting from the house like spikes and sorting trash on the curb according to its appropriate heap. As they were working, a search and rescue team turned up the body of an elderly lady down the street, an image that quieted Estes’ 17-year-old son. Estes says all seven family members displaced by the tornado are accounted for. 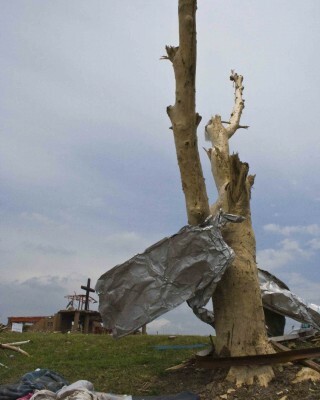 ll told, the EF-5 tornado killed 159 people, leaving nearly 7,000 homes uninhabitable along a swath 13 miles long and three-quarters of a mile wide in Joplin and Newton County, including those of 13 parishioners at St. Philip’s and 10 at Grace Church, where a 14-year-old grandson of one parishioner suffered a broken neck and brain trauma when the parked pickup he was seated in was tossed by the twister into Home Depot. He suffered no damage to his spinal cord and is “doing well,” according to the Rev. Steve Wilson, Grace Church’s rector. His was the only severe injury among either church’s congregation. Estes, Sierra and Wilson were a part of a committee of local laypersons and clergy appointed by Bishop Marty Field to draft a diocesan plan for Joplin’s recovery, which was approved by the Diocesan Council at their June meeting. Why spare my life, and not my neighbor, my sister, my child? Sierra’s house was unaffected as was St. Philip’s. Yet the disaster scene is a vision he cannot shake: it lies between home and work, where he does all he can for the parishioners without homes. He bandages the spiritual and psychological scars. He listens. 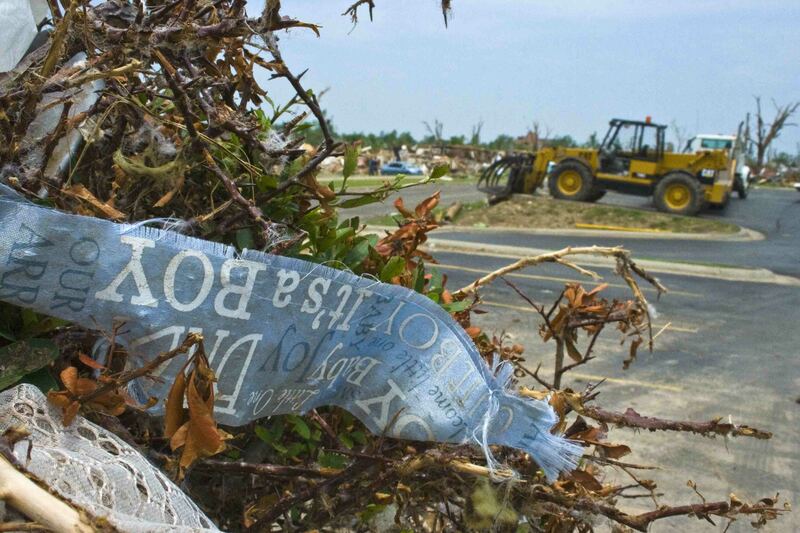 Some people try to return the favor: shortly after the tornado, Sierra fielded a call from a guy offering a construction crew for a small fee, citing his experience with Hurricane Katrina. Sierra politely told the man that reconstruction was not currently a need. The man promptly hung up. “If somebody wants to help Frank, they should volunteer to cut his lawn,” says Wilson, who lives in Carthage. Wilson’s visits to Joplin and its “cosmological destruction” come at a cost: migraines. 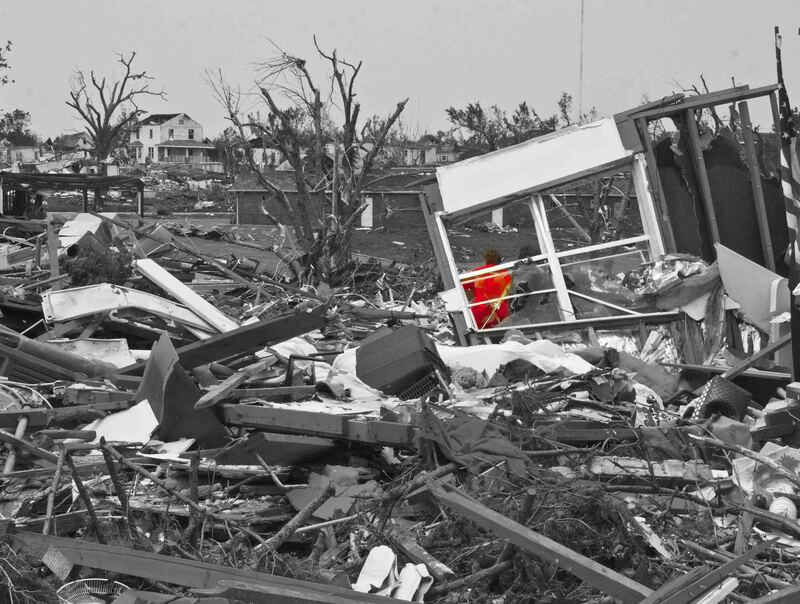 For several days after the tornado, Wilson could find little refuge at his Carthage home, a dozen or so miles from Joplin. 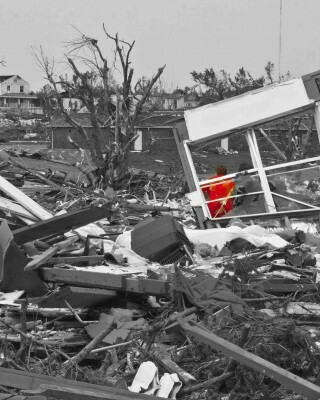 Carthage’s emergency services poured every available resource into Joplin, the shriek of ambulances and fire trucks an all-night occurrence. By Tuesday, Wilson knew the sounds meant body retrieval, not rescue. Wilson hasn’t heard the tough questions yet. The ones that ask why. Why spare my life, and not my neighbor, my sister, my child? Wilson says he became a priest to help people in their greatest time of need, which the Joplin tragedy certainly qualifies. It isn’t easy. He says there is no training, no guidebook on how to engage the guy who tunes his piano. 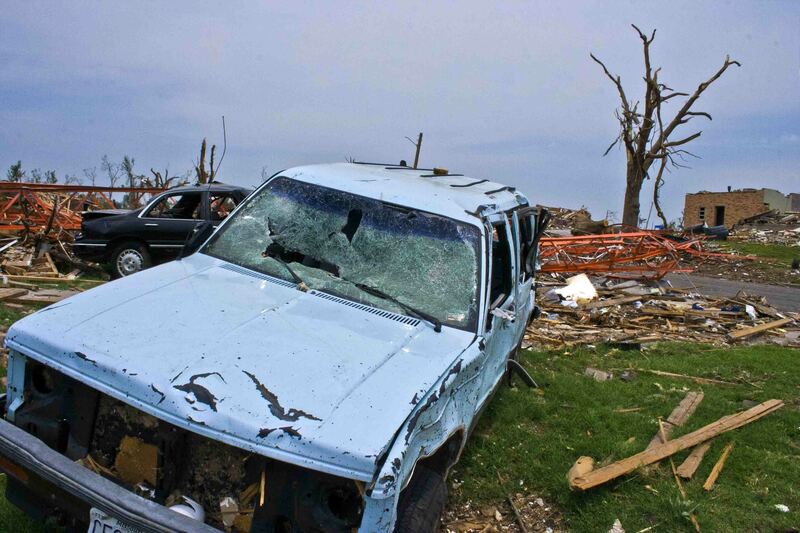 Sierra tries to measure progress during his twice daily drives through the tornado’s path, whether it’s a block swept of debris or the raising of utility poles, like so many crosses.